One of the biggest challenges facing anyone with a busy lifestyle and a tight budget is how to put healthy, nutritious meals on the table for your family. You know that, in order to cook a delicious meal, you need fresh, quality ingredients. The challenge, though, is finding the time to shop for those fresh ingredients in a cost-effective fashion. Thankfully, almost every community has a solution to your dilemma nearby. 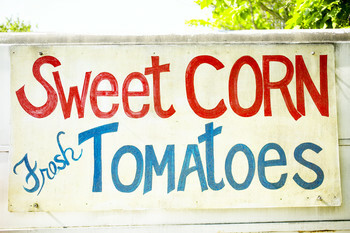 At the local Farmer's market, you can find fruits and vegetables that are grown in your hometown. The Farmer's market also often features hard-to-find items that never show up in your supermarket produce department. I love visiting Farmer's markets, if just to see the variety of produce available. My local market has wonderful cheeses and superb chutneys and relishes, much nicer than anything I can buy at the supermarket. I also like the fact that everything is fresh, prepared and picked no earlier than the day before, often that morning, and brought straight to the market. If you're not sure where to find a Farmer's market near you, click on the link at the bottom of the page, then click on "Find a market". 1. Arrive early. To ensure you have the best selection of homegrown, fresh food available, plan to arrive at the Farmer's market when it opens. Smart shoppers know that the best produce is sold fast - it can go in the blink of an eye. Arriving even a half-hour or an hour after the market opens could mean that much less of the good stuff is available to you. 2. Dress appropriately. Most Farmer's markets are held outdoors. Plan to stay a while, and dress comfortably. If you're in a hot climate attending a Farmer's market in the summer, wear a hat and sunscreen to protect yourself from the sun. If it's cold, wear layers to stay warm for as long as you wish to stay and shop. 3. Buy what you like when you see it. If you see something you want, buy it straight away. Don't go for a look-see and expect it to be there when you come back around, because it won't be. Farmers work hard for their money, and they'll seldom hold produce for you if a buyer walks up and is ready to pay for it. You miss out on some excellent deals unless you jump on them right away. 4. Prepare for variety. Depending on your location, its climate, and the time of year you visit the Farmer's market, the selection can vary widely from week to week. If you see something you like, jump on it. It may not be available next week. 5. Bring an open mind. Many who are new to Farmer's markets make the mistake of only purchasing items they're used to cooking with. The Farmer's market is your opportunity to experiment with flavours that are foreign to you. You'll find palate pleasing fruits, vegetables, cheeses, condiments and baked goods that add variety to your home's menu. 6. Be willing to leave your comfort zone. Even produce you've never heard of before can add zing to your food. While you may not know how you're going to use each ingredient you purchase while you're at the market, it's easy to find recipes that use each ingredient online. * Remember that the farmers selling their goods are experts in the produce they're selling. If you ask them for examples of how to use unfamiliar produce in your cooking, they'll often be more than happy to give you an idea or two. Ask lots of questions. 7. Bring cash. In most Farmer's markets, the only way to pay is with cash. Stop by the ATM on your way to the market to ensure you're able to enjoy the unique, homegrown produce that you find there. And try to have smaller denominations, change can be hard to come by at very busy markets. 8. Give yourself time to look around. By doing so, you may save money by finding a different vendor with the same produce at lower prices. Or, you'll find items other than fruits and vegetables that may suit your fancy. * Often, some of the best breads and organic jams and preserves can be found at your local Farmer's market at prices lower than the stores. In addition, nonfood items like homemade soaps and crafts can be found at the Farmer's market at bargain prices. By visiting your local Farmer's market and using these tips, you can enjoy fresh food and fresh savings. In addition, you'll be supporting your local community while cooking with and eating healthy, mostly organic ingredients and helping the environment by buying locally grown and produced food. Your local Farmer's market offers affordable prices, a unique selection, and a chance to try new foods that'll make you smile. And if nothing else, it's a lovely morning out.